Started his fencing career in 1988 and has been a professional fencer for 21 years. He participated in two Olympic Games (2000 & 2004) and took 5th place in the 2004 Olympics. He took part in every Senior World Championship from 2000 to 2009 and became the Individual World Champion in 2003. Vladimir was the individual Champion of the World University Games in 2003 and silver medalist of European Championships in 2006. He won countless medals in World Cups, European Championships and World University Games. In 2004, he was awarded the World Cup fencer of the year, finishing with the best overall results out of all World Cup participants from all countries. 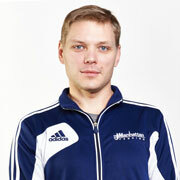 Vladimir started his coaching career in 2009 as the Japanese men’s and women’s saber National Team coach. His students won medals in the Asian World Championships and his student Sierra Nakayama qualified for the 2012 Olympics. She placed in the top 16 at the Olympic Games in London. He graduated in 2003 from Kiev National University of Physical Education and Sport of Ukraine with master degree in Physical Education. In 2009 he got his second degree from Kiev National University of the state Tax service of Ukraine.